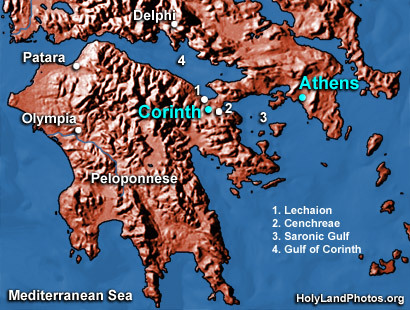 The Site of Corinth was situated in the northeastern corner of the Peloponnese — very near the narrow land bridge (isthmus) that connected the Peloponnese to the mainland of Greece. Its strategic location was enhanced due to its proximity to the diolkos — the stone-paved roadway that connected the Saronic Gulf with the Gulf of Corinth. By using this overland passageway, passengers and cargo avoided the difficult and time-consuming trip around the southern end of the Peloponnese. The Greek city of Corinth had been (partially) destroyed by the Romans in 146 B.C., but the rebuilding process, as a Roman city, had begun by 44 B.C. In Paul's day there may have been 200,000 people living there. For a long time it had been famous for its immorality and its commercial character. Its two harbors were Lechaion (Gulf of Corinth) and Cenchreae (Saronic Gulf). Every two years important games were held at nearby Isthmia. Paul spent 18 months here on his second journey and maybe three months on his third. The letters of first and second Corinthians were written to the church here, and Paul probably wrote first and second Thessalonians and Romans while in Corinth. To view important artifacts from Corinth, including the Erastus inscription, a menorah, and others, Click Here. Excavations have been conducted at Corinth for over 100 years. Major finds have helped us understand the history and culture of the city that Paul spent so long ministering in. See the images included in this section and John McRay's Archaeology and the New Testament. Grand Rapids, MI: Baker, 1991. To view for purchase Click Here. Suggestion: You may also be interested in the images of the Corinth Canal, the diolkos, the port of Cenchreae, and the Acrocorinth. For a very informative 14 minute video on Corinth see This. I think that even veteran travelers to Corinth will be impressed. Lots of New Testament connections.